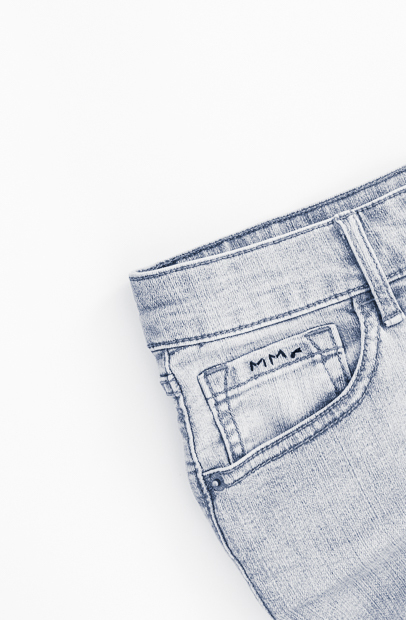 DIY Monogram Jeans | MeetMinnie. INSTRUCTIONS: Step 1: Plan placement and style of monogram or initials. We opted for the coin pocket and basic initials. Because this is a freehand design, there is no need to make a pattern. If, however, you would like a guideline, simply write out your monogram or initials on a piece of washi or painter’s tape and place tape on desired location on jeans. You can then stitch through the tape as you go and remove when finished. A note on lettering: because of the difficulty of creating curves with stitches, use square lettering (think digital clock). But don’t stress too much. We happen to think the more imperfect, the better. Step 2: Begin embroidery with a knot at the period following the initials. Step 3: Stitch all vertical lines. Step 4: Go back to stitch all right diagonal lines, then back once more to stitch all left diagonal lines. (These steps will vary depending upon the letters used.) Step 5: If using tape, remove it and tighten all stitches. Step 6: Knot off end inside. Hand wash.